A lot of ground has been trodden about Mindfulness and its many facets, but there is one topic I have seen not enough people elaborate on, especially in a satisfactory manner, and that topic is gratitude. The act of expressing gratitude is a behaviour that grounds you in observation of the present moment; of the present you, and of what matters to that present you. It can help you understand the current, immediate moment, the Now, by pushing you to examine parts of it that you might have taken for granted. Or parts that hide behind the other parts. It is a tool of positive exploration, that empowers the user to iteratively discern the heart of matters, of things, guided by the unerring principle of genuine appreciation of what counts. You can get to see both sides of a scenario this way. You can see the people who did work behind the scenes and the remnants of the people who created the ground on which you stand. You can see the world unravel before you, and reveal its whispered details to you, piece by piece, as you put old things under a new and empowering lens. All there is left to do then is to acknowledge it. In this moment, around you, exist quite literally the results of the collected life efforts of every single creature that lived up to this point, which is the basis for what every single creature from this point onwards will now create. Hundreds of animals died years and years ago to power the cars that take millions of people to hundreds of thousands of buildings to flip trillions of switches that make the rest of the social and economic engine of the entire world function. We get to experience this lifestyle from the results of an untold number of hours put into creating all of the technology stacks that our careers are built on; and then, there are some who just start arguing about semantics involving which pattern of bytes is better. Sometimes the right perspective helps. A core principle of appreciation is that there is value in everything. There is an observable beauty in all things, in the way they exist, in the way they relate, and how they give meaning and purpose to each other. If you don’t see it immediately, sometimes it helps to rethink the angle. Consider a blackberry that is one week before ripeness. It is a sweet fruit. It is delicious. It has a slightly bitter aftertaste. You might compare to the fully ripe blackberry, and lament the bitterness, or you could come to appreciate the blend of flavors just as it is. You might appreciate the novelty in taste compared to the usual ripe blackberries. You might even like it better. Nature might reveal some imperfections, some asymmetries, some flaws, but the imperfections can make it all the more beautiful and intriguing. Four leaf clovers are genetic mutations. The gnarliness of an olive tree makes it distinctive, and symbolic. Sometimes the imperfections literally make the style, as in wabi sabi. Imagine the drawings of a young child. They are not always going to be aesthetically pleasing to us, but that does not matter to them. They draw to perpetuate the beauty they observe; they draw so we can capture what they see, so that we become able to reflect back on it. Following that sentiment, we might want them to improve; we push them so they can create genuine works of art. But not every one of them is going to end up an artist. Pushing them to achieve results might end up having them compare themselves to older, better people than them, and discouraging them from furthering their own practice. Instead, sometimes they draw just because they have half an hour to kill, or just really want to draw, and that’s okay. We can acknowledge that sometimes self-expression doesn’t have to shoot for excellence, or for pleasing others; and instead, it can be just a simple pasttime, a venting channel, or a way to create a personal universe where they can express themselves better. Or, consider how we don’t know what works of ours will create the most impact. Sometimes our “worst” creations end up having the most lasting and widespread effect on others. Sometimes what looks like a mistake might just end up accidentally resulting in a work of genius. The sheer novelty of the straying path might lead us towards new revelations and new beauty. Those are perspectives to help realize how beauty and meaning can sometimes be hidden from plain view, but they are nonetheless, observable, through the simple, continued intent of appreciating life simply for what it is. Gratitude can be expressed by just summarizing the reasons you are able to do what you do currently; what supports you in your pursuits. You can be grateful for your coworkers and being able to collaborate with them. You can be grateful for the engineering that has gone into your bed, in order to make it a comfortable place to sleep. You can be grateful for the team responsible for the metrics that are collected when you made a HTTP request to this webpage. You can be grateful for the sun warming our planet. You can be grateful for quite anything and everything that crosses your path. - And, by incorporating gratitude into meetings and family times such as shared meals. A gratitude sanctuary can be as easy to create as a slack channel named #gratitude then followed by you listing something you are grateful for, and inviting people to join in. Once the idea starts, people will sustain it mostly on their own without having to do much moderation or filtering. People will naturally see things go there and put their own right next to the other expressions of gratitude. Fitting gratitude into other parts of your daily life can be as easy as blatantly stapling it to the side of other topics or actions. If you are leading a meeting, start by going around and asking people to say something they are grateful for, related to the topic at hand or otherwise. When you are eating with your family, start the conversation by going around the table and having everyone say something, anything they are grateful for. An unspoken rule of this behaviour that is fun to act on is to just let the gratitude take you where it will. Operating with appreciation is moving under a new intelligence, which can lead you in very novel and unexpected places; sometimes places of deep illumination, or of profound liberation. Sometimes looking for gratitude will uncover things that are very unbalanced. Sometimes you will find people who are not in good places. It happens. If you can’t help them and don’t know someone who can, you could empower them to find someone who can help them better themselves. If you find yourself in doubt on these matters, you can ask someone you trust, or a therapist. Gratitude can also be applied by acting on the clear feelings of the moment, and taking action to better that person’s life. Every time you see someone at work do something you feel grateful for, message them and ask them if there’s anything you can do to help make their job better or improve their day. If it’s reasonable and you have the time, give it to them. They will appreciate it. Sometimes your actions of gratitude can even be the catalyst to lasting change. Support your targets of gratitude by being there for them when they need it, but backing off when they don’t. If you’re not sure, ask them. Adults can tell each other yes or no. This should be like setting out a bowl of milk for a cat. The cat might start drinking on its own volition, but it shouldn’t be forced to drink. The cat might not even be thirsty. Cats can be mysterious creatures, and their needs are their own, so what one can do is offer the support, for them to take. Cocreation is another essential part in understanding how to express gratitude. Cocreation is the acceptance and use of feedback in your actions, shaping your ongoing behaviour through adaptation to the observed middle results. It is the acknowledging that every act towards another, or with another, involves a partnership of some sort. It is the opening to the correlation, or co-relation, of your acts and others’. In a way, cocreation can be seen a continuous dance between the universe and the individual. Each side influences, creates the other. The universe is constantly created by the actions of the people in it. The people are constantly created by the actions of the universe they inhabit. If you create in it someone that expresses gratitude and can help others do it in turn, you create a universe with more creators of gratitude, and that can create even more. Expressing gratitude helps you create creators of gratitude who create the universe that creates you. A good way to understand cocreation is to use the M.C. 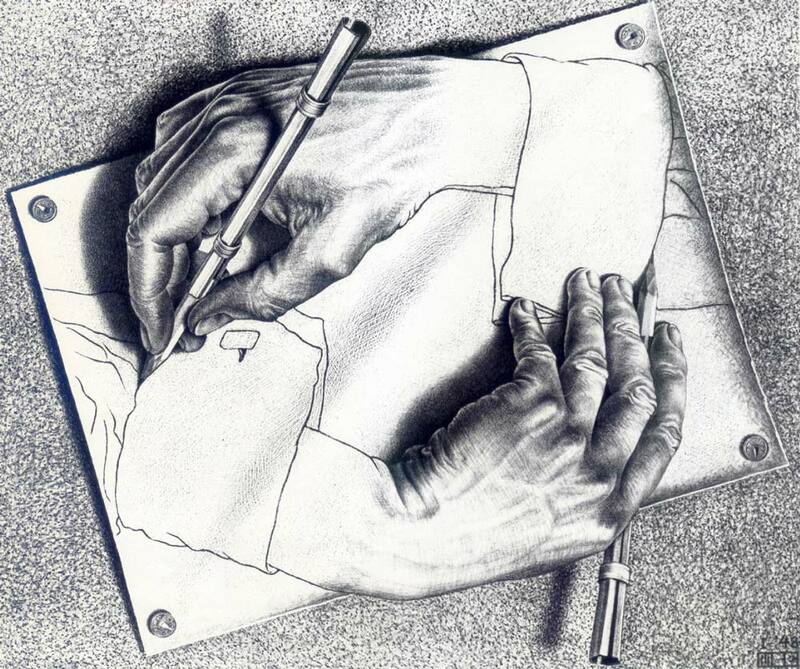 Escher lithograph Drawing Hands. The left hand creates the right hand. The right hand creates the left hand. They both create each other without there even having to be an original source anymore, in a strange loop of recursion. They are the source. You are the source. You are the root of the strange loop. You matter because you can change how you create the universe. Even if your changes only affect some “local” part of this universe, your actions may end up kicking off processes you could never even have conceived happening. Life is a gift. Each of us is a creator of a personal world, that can be made beautiful, and that can enrich other worlds. We are life’s gift. What other reason does there need to exist to be grateful for?